powder, to parents. Following a complaint by NGO Breastfeeding Promotion Network of India (BPNI), the Ministry of Health & Family Welfare is looking into the claims and has also forwarded the matter to the Union Ministry of Women & Child Development (WCD), which is responsible for promoting breastfeeding in India. 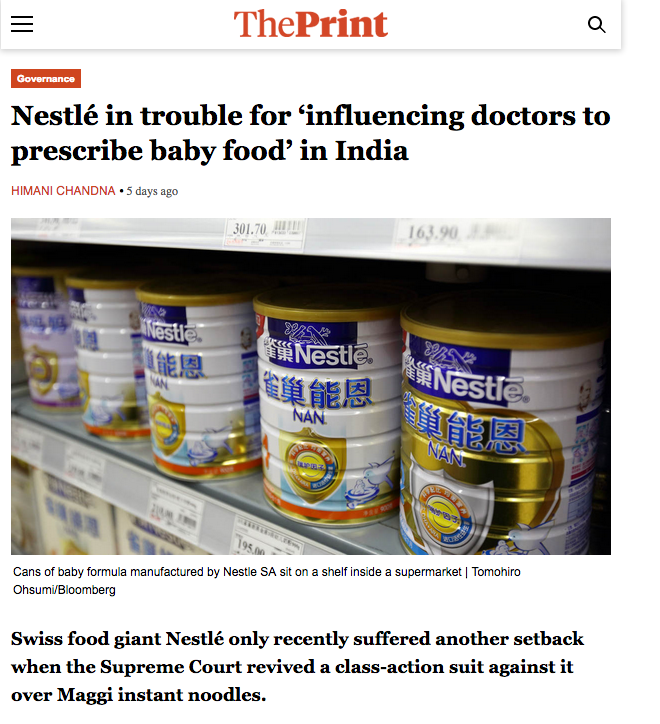 The complaint is about an event organised by Switzerland-based Nestlé Nutrition Institute, a research body affiliated with Nestlé, in October last year, which BPNI claimed was an industry-supported meeting intended to influence doctors into prescribing their baby food. Ministry, to take “necessary actions” in the matter. The allegations of Nestlé influencing doctors in violation of law have come to light days after the Supreme Court revived the central government’s class-action suit against the company over the alleged breach of food-safety standards in the manufacture of its wildly-popular Maggi instant noodles. The Nestlé Nutrition Institute has denied the allegations, claiming that the programme was just meant for knowledge exchange. J.P. Dadhich, the NGO’s technical director. BPNI flagged the event to the Delhi unit of the Indian Academy of Paediatrics. health workers by product manufacturers. workers by companies manufacturing baby products listed under the IMS Act. Times noted in a report last year, has seen baby-food sales “flatten in wealthy countries in recent years”. Denying the allegations, the Nestlé Nutrition Institute said the event was not organised to promote instant formulae. “Nestlé Nutrition Institute [NNI] organises scientific workshops wherein healthcare professionals discuss various scientific topics and share science-based nutrition information,” a spokesperson told ThePrint in reply to a query. “The participation to these sessions is voluntary. The objective of the session mentioned by you was also for the purpose of sharing science/nutrition-based topics and not to promote infant formulae,” the spokesperson added.